While shark finning is still legal in parts of the world (and practiced illegally many other places), most developed countries have outlawed this practice. Some fishing nations regulate the fin trade by the use of “fin ratios”, which means that fins can be removed from shark bodies at sea as long as the bodies are brought to shore and the total weight of the landed fins doesn’t exceed a certain percentage of the weight of the landed bodies (typically 5%). There are a lot of problems with this management strategy, but its a lot better than finning because it is less wasteful and it allows managers to see what species have been harvested. The best possible shark fin fisheries management practice is landing sharks with “fins naturally attached” (as part of a comprehensive strategy that includes science-based fishing quotas, appropriate protections for threatened species, appropriate monitoring, reporting, and enforcement, bycatch mitigation strategies, etc). After the sharks are landed “whole” and reported appropriately, the fins can be removed and sold. In other words, if a shark carcass is brought to shore, even without fins attached, that shark has not been finned. If a shark carcass is brought to shore with its fins attached, as long as it isn’t a threatened species and it was caught according to a science-based quota, this situation is not only not something we should be criticizing, it is, in fact, that goal of responsible shark fisheries management. This misconception is important in explaining why I (as well as many, many other scientists and natural resource managers) do not support “fin ban” legislation that makes it illegal to buy, sell, or possess shark fins regardless of where they came from. These bans do not allow for well-managed fisheries to supply the marketplace with fins, and they do absolutely nothing about other shark fishing issues. In contrast, a comprehensive shark fisheries management plan addresses all the shark fishing issues and allows for well-managed fisheries to supply the marketplace with fins. Another important point about shark “fin bans” is that they do not address shark “finning” at all, despite what many supporters claim. Finning is largely illegal already in the areas which are considering fin bans. Almost all shark scientists and natural resource managers, including myself, are opposed to finning. Quiz: here are some common types of images used in shark conservation awareness campaigns. Which of these sharks have been finned, and which have not? Answers are at the bottom. 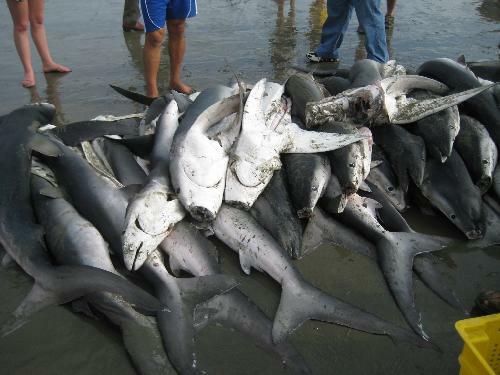 1) A pile of dead sharks along a beach/street/ fish market- have these sharks been finned? 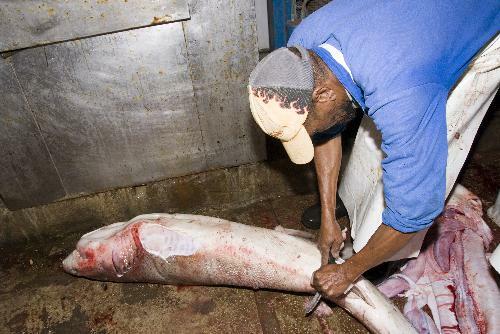 2) A man removing the fins from a shark- is this shark being finned? 3) A fisherman holds a still-bleeding shark fin and a knife. Is this finning? 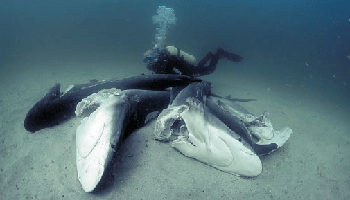 4) A big pile of shark fins- did fishermen get these from finning sharks? 5) Dead or dying sharks on the bottom of the ocean without their fins- have these sharks been finned? 1) No. These sharks have been landed whole, with fins naturally attached. As long as the sharks aren’t a threatened species (they aren’t in this case) and they are landed according to a science-based quota (impossible to tell from a photo like this, though likely not the case considering where the photo was taken), this is an example of responsible shark fisheries management (Clarification based on a reader’s comment: this may be an example of responsible fisheries management, which could very easily look just like this, but you cannot tell from the photograph). Regardless, this is not finning, and photos like this should not be used in anti-finning awareness campaigns or petitions. It may make a reasonable point about the scale of shark fishing, but it is not a photo of finning. 2) Maybe. From this picture alone, we can’t tell if what is happening is actually finning. If this is happening on a fishing boat and the carcass will be dropped over the side, then it is finning. It this is happening on a fishing boat, but the carcass will be landed separately, it is not finning. It this is happening on land, it is not finning. This last option is what’s really happening here (it isn’t finning, this takes place in a “shark processing factory” on land in South Africa) , but there’s no way to know that from just looking at the photo. It’s reasonable to use photos like this in anti-finning campaigns. 3) Maybe. Again, it’s impossible to tell from the picture. It likely was taken on a fishing boat, since the water is clearly visible. However, if the carcass is landed separately and this is a fishery where fins are managed according to a “fin ratio” plan, then this is not a case of finning. If the carcass is discarded, it is a case of finning. It’s reasonable to use photos like this in anti-finning campaigns as well. 4) Maybe. It isn’t possible to tell where shark fins came from just by looking at them. They may have come from an animal that was finned, they may have been landed separately from the associated carcasses according to a fin ratio, and they have come from animals that were landed with fins naturally attached. It’s reasonable to use photos like this in anti-finning campaigns, too. 5) Yes. These animals had their fins removed, and the rest of their bodies were dumped overboard. These poor sharks have definitely been finned. However, I hardly ever see photos like this (the only photo that shows a shark that has certainly been finned) in shark finning awareness campaigns. If you are going to take the time to “spread awareness”, please first make sure that you understand the basics of the issues you are trying to educate others about. Increasing the level of confusion and misconception that’s already out there only makes things worse for the oceans, and demonizing responsible fishing practices can undo decades of progress made by those who do understand the issues. Author’s note: I will continue to respond to new points raised in comments on this post, but as is often the case in discussion threads with more than 50 comments, people are starting to raise points that have already been addressed. I’d like to invite those interested in continuing this discussion to check out the first “Blue Pints” Google+ Hangout between Andrew and I, in which we discussed shark fisheries, and to continue this discussion in the comment thread there. Nice article David! Hopefully this will encourage a more accurate conversation on the topic. I`m somewhat curious as to why ANYONE who is chaampioning the conservation of sharks would even bother to try to explain what is finning and what isn`t. After all sharks (the range of species)are at possibly an all time low in numbers. So, can we simply agree that sharks should not be targeted as a species AT ALL? FFS all this talk of what is finning or not is simply play into the hands of those that do fin, and / or catch sharks commercially! No. No we cannot. What you’re suggesting is wildly out of step with current global fisheries policy. Even if we could agree that sharks shouldn’t be targeted at all, it would still matter that activists were arguing for this point using basic terms incorrectly. Of the 14 species most prevalent in and valued by the shark fin trade, 100% are classified by the IUCN (based on extensive scientific data and population assessments) as Threatened (71%) or Near Threatened (29%) with extinction. All of these species have suffered dramatic population declines over the past 20 to 30 years, the same period over which the consumption of shark fin has grown. This is hardly a basis or argument for ‘sustainable’ management. If fisheries management of sharks worked, bans wouldn’t be necessary in the first place. In many cases, calling for that now, is a little too little, a little too late. Additionally, of course SOME scientists and managers may call for ‘better management’ as that is their training and vocation. We all feel our tool is the best. I would suggest it will take a combination of both improved management and bans. The letter concludes “Given that sharks play an important role in maintaining the delicate balance of the world’s marine ecosystems, and that many species of sharks are now threatened or near threatened with extinction, there is a rare opportunity to make a significant impact on an issue of global importance by helping to regulate the burgeoning international trade in shark fins.” REGULATION of the trade is specifically addressed in the letter. And it is worth noting that one of the signatories of the letter is the blog author’s PhD advisor. Agree that being clear on the definition of what ‘finning’ is IS important in order to make a clear, compelling case for how important a tool shark fin bans actually are. However, if one reads the posts, articles and press releases of responsible, internationally engaged shark conservation organizations (those who deal with the shark fin trade ban issue, daily), the careful observer will note that the terminology regarding ‘finning’ is made clear whenever and where ever necessary. I have stated countless times, including in this post, that I favor increased protections for threatened species. If a population is overfished or experiencing overfishing, fishing pressure needs to be greatly reduced for that species. In some cases, banning the harvest of a particular species entirely (all harvest, not just for fins) may be appropriate. That doesn’t mean that we can’t harvest any shark of any species, and it doesn’t mean that a total ban on the fin trade is necessary, or that a total fin ban is the best way to help protect those species. That’s true. The current global system is, on the whole, unsustainable, though some nations’ shark fisheries are relatively well managed. I’ve never claimed otherwise. However, that letter absolutely does not call for a fin ban. It says “the overwhelming body of scientific data supports the urgent need to focus on adequate conservation and management strategies”. It also calls for “helping to regulate the burgeoning international trade in shark fins”. Regulate using adequate conservation and management strategies, not ban. Regulation of the shark fishery using adequate conservation and management strategies sounds a lot like what I’ve been arguing for. I don’t know every author who signed that letter personally, but I know for a fact that several of them are against fin bans. The purpose of this post isn’t to criticize responsible large-scale organizations like Shark Savers, who do a very good job of getting their facts straight. The purpose of the post is to educate those individual activists and small organizations who create “awareness” videos that do not have their facts straight. I’ve come across too many of these to count in recent weeks, and “spreading awareness” of the wrong facts doesn’t help. Thanks, as always, for a stimulating and respectful discussion. It is worth pointing out the difference between finning and fishing, because most people are calling for an end to finning, when they actually mean fishing. If they get a finning ban, which for most of the world is already in place, they will be very disappointed. This is a great post, David. It was unclear what the purpose of the post was. It started out with good facts about how to define key terms like ‘finning’ but then went on to vaguely and irresponsibly state that ‘many, many’ scientists are against shark fin trade bans — from my experience I don’t believe this is true and if it is, it is a sad state of affairs, indeed. Bans are an effective form of regulation and responsible conservation organizations are finally making headway at the heart of the trade using sound scientific facts and well-crafted legislation around bans. This blog will, unfortunately, likely serve to provide fuel to the fire of the opposition potentially undoing years of conservation work. It is disheartening, to say the least. The species in question isn’t threatened, and if they were landed based on a science-based quota (which may or may not be the case but probably isn’t based on where the photo was taken) then it’s relatively responsible fisheries management. 4) Appropriate reporting and enforcement. I would argue that bans create the incentive for illegal activities and, since demand remains high, have the effect of shifting effort to regions where bans aren’t in place or enforcement is lacking. We’ve seen this with rhinos and tigers. At the same time, banning fin possession may not have a broad-scale effect on reducing overall shark mortality, since sharks can still be landed legally (with the fins simply destroyed at the dock). Much of the fin ban legislation being proposed also makes sweeping exceptions for commercially important, yet vulnerable, species like spiny dogfish. Respectfully, it seems like many conservation organizations are wary of (or reluctant to support) banning the fin trade because, like David points out, the movement draws largely on misconceptions of the shark finning issue. Many would also agree that bans would make it more difficult for managers to design more sustainable tools for shark species that are more resilient to fishing pressure, or not currently overfished. Perhaps it would be worth discussing possible alternatives to bans that would address important issues like trans-boundary migrations and bycatch. Nice post as always David. It is great to have these facts clarified for those interested. It is important to note that the ambiguity in terminology used, and the improper inter-changing of these vocabulary amongst the general public is not specific to the issue of “finning” alone, but is also prevalent in other aspects of fisheries management (i.e., maximum sustainable yield, overfishing, etc). I think that this article, and the future discourse I am sure it will generate, are an example of the challenges facing both fisheries management as well as marine conservation scientists as they navigate issues surrounding threatened species. Not all sharks are threatened – whilst some are highly imperiled and deserve proper triage. Getting everyone on the same level is a difficult task, but an important one if we are to best approach difficult issues such as the policy of shark finning. David-can yo provide any reading materials on these issues for those interested? Sadly, there are no iron clad means of verifying if dried fins come from finned sharks or otherwise. The fact is, fins only provide ingredients for an ostentatious food that has no nutritional value. Our continuance to partake of it can only lead to continued supply via any means. As long as money is involved, people will supply. This is the same for many species now. Bear, tiger, ivory, and rhinos to name a few. Demand must stop for the flow of harvesting to end. Raising awareness so that we all become responsible stewards of our home planet is the sole path to a sustainable future. Hey, I’ve never commented but your posts show up a lot in my google alerts and I’m very impressed by your thoughts on finning. Thanks for addressing something that, as far as I can tell, no one in the movement to end shark finning really addresses at all – that bringing bodies to shore is very different than throwing them overboard. I find it so confusing that people toss around pictures of sad shark carcasses ON LAND to prove their point that shark carcasses are being wasted – it seems so obvious that their logic is flawed somewhere. A thought..bringing the bodies back to shore is certainly less wasteful and destructive, but is it really an example of the best we can hope for in shark fin industry management? I hope not. The very existence of demand for shark fin is a symptom of a sick system, and I say that as a critique of the consumerism epidemic, and not of a Chinese tradition. It’s part of an overall plan for more sustainable fisheries. Hi David, quick question about the landed shark carcasses – do you know if the only requirement is that they have to be landed? Could they then just be dumped, sold for dog food etc.? I don’t hold out much hope for straight-up bans working. The enforcement and compliance costs are likely to be huge, and uni-lateral bans (as opposed to things like negotiated closed seasons and other management strategies) are much more likely to get lots of push-back from fishers and traders. Landed and reported. Afterwards they could theoretically be dumped, I suppose, but the goal is that by requiring that the carcasses are brought back, it will encourage full use (i.e. selling the meat as well). There have certainly been busts and enforcements of bans — most recently in California; and as more laws are passed there will be more reason to pursue enforcement of them. Bans are not the sole answer but to be ‘against’ them as a whole is to throw away one of the few tools we have that can lead to positive change. To save dwindling shark populations (for those populations that ARE in trouble) we should consider applying whatever tool works best, whether much-needed improved international fisheries management, creation of sanctuaries, or regulations including bans. And, again, if ‘science-based’ fisheries quotas worked on their own, we wouldn’t need additional measures like bans or consumer regulations. CITES listings are essentially bans by Convention of the Parties, aren’t they? Surely, the author supports the listing of additional species to CITES such as great hammerheads? And, yes, when scientists come out publicly (in the press or blogosphere) and make innocent but simplified statement like ‘we are against bans’ or ‘we don’t know how many sharks are killed each year’ it does provide considerable fuel for the opposition (who, now more than ever are fighting back in the press and working to turn public opinion in Asia); believe me, I deal with it on a regular basis. The big issue with bans is that if we ban the shark fin trade from somewhere like California where it can be regulated quite effectively, it may move to a country where fisheries governance is poorer, and landing regulations would not be as well enforced. It would be great if we can change attitudes so demand for shark fins dies. But while it is there, we need to engage fisheries to try and make them sustainable. Quotas are necessary, but we know from other fisheries that they are not sufficient without monitoring, reassessment and enforcement, which I think we all agree on. That’s what is meant by a well-regulated sustainable fishery. I’m assuming you mean listing as CITES 1 Samantha? CITES 2 & 3 do allow for trade in the species. The hammerhead proposal she references is for CITES Appendix II. No, not CITES Appendix II listings, which is what has been proposed for hammerhead sharks. CITES Appendix II listings require regulation and monitoring of the international trade of a species to ensure that the trade doesn’t harm the population of that species. Improved regulation and monitoring (i.e. exactly what I’m calling for), not a ban. Also, there’s a big, big difference between a harvest ban on a particular species that’s particularly threatened (which I’ve said many times, including in this post, that I support) and a fin ban, which bans all trade of fins regardless of what species they come from and the fishing method used to acquire them. Also, with respect to your claim that I am “giving ammunition to shark fishermen and lobbyists”, I’m not saying anything new here. By calling for improved management and regulation of shark fisheries, I’m merely summarizing dozens of scientific papers and technical reports- all of which are available, and not one of which (that I’ve seen, at least, and I’ve seen most of them) recommends a total ban on the fin trade as an effective conservation and management tool for sharks. If you (and the other participants in this discussion) would like, I can prepare a summary of these recommendations as a separate blog post. They make the exact same point that I’ve been making- that what we need is science-based quotas for species that can be harvested, special protections for particularly threatened species, appropriate reporting and enforcement, and appropriate bycatch reduction strategies. Again, not one of the dozens of shark conservation scientific papers and technical reports that I’ve seen has recommended a total ban on the fin trade, and many of the authors of those papers that I’ve spoken to oppose total bans on the fin trade. I’m not being “vague”, I’m just not naming names of people who have spoken to me in confidence about a controversial issue. David, I’d be really interested in seeing a list of recommendations similar to that as well- especially if it includes recommendations that oppose to fin bans to other regulatory measures. Thanks for the links! I have copies of those reports as .PDFs but it’s very helpful for readers to be able to access them online. How about an article that discribes the difference between true conservation and making money to attach an electronic parasite on every shark you can catch. Conservation has become a scam to make more money at the expense of sharks which is no better than the people that eat them. Are you suggesting that non-lethal science that aims to generate data critical for improving the management of sharks is exactly the same as killing sharks for profit? Please cite an example of a lucrative conservation scam. Great Post! I wasn’t aware this confusion existed. Thx. From what I understand, the legislation put in place in Hawaii, CNMI, Guam, Washington, Oregon & California was a calculated and premeditated plan to essentially close West Coast ports and harbors to the importation or landing of any sharks fins in an attempt to cripple the sharks fin industry. From what I understand, finning would take place South of Hawaii near the equator and fishermen would land fins in large quantities (tons) in Hawaii before making their way to China to be processed. A friend of mine who I will leave out of this discovered several tons of fins in a warehouse near a harbor in Hawaii and that sparked conversations with Senator Hee and the rest is history. It was beleived that Guam and CNMI would be a future “pit-stop” for fins with Hawaii banning them so legislation was put in place there by the same parties involved in Hawaii. Eventually the push was to shut off West coast ports. It was believed that all 3 states needed this legislation, otherwise fins from China could still make their way in. An unfortunate byproduct from the CA legislation was that honest shark fisherman, who are already over-regulated in my opinion now had one more restriction and one more chunk taken out of their bottom line. Some supported the legislation, some didn’t. I learned this first hand. Some wanted a “chain of custody” system to allow them to continue to sell their fins but the Department of Fish&Game testified against this motion because they lack funding and enforcement to implement such a system. Seems it would be hard to find a paper that shows that fin bans are an effective tool in shark conservation considering how recent the bans were put in place. Soon, sharks fins will no longer sold in L.A. and S.F. China towns. Sharks fin soup will not be served at all either. All and all I’m pretty stoked on that. The United States shark fishery accounts for 3.72% of the global total annual shark landings, and that includes both Atlantic and Pacific fleets (according to TRAFFIC’s 2011 report). Even if we stopped all U.S. shark fishermen from supplying fins to the global market, more than 96% of all shark fisheries globally would be unaffected. I don’t have specific numbers for shark fin consumption, but China dwarfs the rest of the world- again, even if the entire U.S. banned consumption of shark fin, it would have a relatively small impact on global consumption. Sure, but sharks can still be overfished in California waters, bycatch and habitat destruction aren’t addressed at all, some threatened species lack the species-specific protections they need… and the global consumption of shark fin soup is basically unaffected. Unfortunately I wasn’t clear, David. I was absolutely not talking about U.S. shark fisheries when I say the “shark fin industry,” nor do I think U.S. fisheries land a significant amount of sharks compared to other nations. I’m proud to say that our Thresher and Mako shark fisheries are well managed and their stocks are on the upswing. I was talking about the fins that come from China, Costa Rica, New Zealand, etc. and enter our ports here in California. Shark finning is still legal in New Zealand and the fact that those fins enter our ports undermines the current laws we have in place here to protect sharks. Here is a link to a query of all fins that came through CA’s ports in 2011 and it even says what country they came from, weight and dollar value. I thought AB 376 went into affect January 2012 and any sales of fins must be fins that were already purchased prior to January 2012? What am I missing here. This is the stuff I thought AB 376 was going to stop which is the importation of fins (as well as the sales, possession and distribution)? Let me make sure I’m understanding your point- you are saying that fin bans are good because they prevent consumers (in places where bans are in effect) from obtaining fins that came from poorly managed and unsustainable fisheries (in places like New Zealand, etc) ? Is that correct? Sure, that’s true, but the level of consumption here is much, much, much less than in China. As for your question about importation of fins, “buy, sell, or possess” should indeed restrict imports of fins. You can’t really import something without “possessing” it. I’m not sure what’s happening there. Seems to me that it would be better to ban the importation of fins into the US. US fishermen are highly regulated already. Local demand could be met by local supply instead of allowing imports from less regulated fisheries. That would certainly reduce U.S.-based consumption of shark fins that come from poorly managed fisheries. However, U.S.-based consumption of shark fins that come from poorly managed fisheries isn’t very large compared to consumption in China and other parts of Asia. Yes, you are saying something new. You are saying “many, many, scientists are against shark fin bans” and that is by its very nature a vague statement. How many? Who? If they don’t want to say so publicly, I would ask why — if the case against bans is so clear-cut and science-based there should be no problem. As it stands, that statement can and likely will be picked up by the opposition that are now coming on strong, especially in Asia. As for “what we need is science-based quotas for species that can be harvested, special protections for particularly threatened species, appropriate reporting and enforcement, and appropriate bycatch reduction strategies.” That would be great. International bodies and federal fisheries agencies have not been prevented from doing so and in some cases are working towards implementing those strategies. But again, if those alone worked, we would not be faced with the current status of so many shark populations — severely depleted. Are some populations ‘doing fine’ and could be harvested ‘sustainably’; in the short, perhaps. But given massive pressures on global fisheries, that is a tall order in the long run and past history isn’t at all reassuring that those standard approaches will work for sharks. Bans are a much-needed additional tool, when applied appropriately. Responsible conservation organizations approach bans on a case-by-case basis and negotiate exemptions when/where they are appropriate. Agreed- implementation of effective fisheries management strategies isn’t happening across the board. But it is happening in some cases, and it has been successful in some cases. Much of the depletion occurred before these management strategies were tried on a large scale. The U.S. Atlantic sharks fisheries management plan, one of the best in the world (though there are still issues that need to be resolved) wasn’t implemented until 1994. Since that time, many previously-depleted shark populations have started to recover. Ongoing depletion is largely occurring in areas without well-managed fisheries. As for “If you (and the other participants in this discussion) would like, I can prepare a summary of these recommendations as a separate blog post…” I think such a list of ‘recommendations’ would make an excellent peer-reviewed paper in the scientific literature perferably in one that focuses on science applied to conservation. It’s one table of a paper I’m working on which is along the lines of what you’re describing. I’ve been diving in Florida waters for decades; I’ve personally seen large schools of scalloped hammerheads, bull sharks and sand tigers virtually disappear from our waters primarily due to commercial fisheries expansions in the 80’s — increased quotas. Without question, I would argue that the kind of fisheries management strategies you are recommending (in place of bans) have, to date, failed miserably. And in many cases even science-based quotas combined with efforts at more enforcement have failed as well. That is how we wound up in the mess we are in now! Additionally, why would fisheries scientists or shark biologist support the fishing of any shark populations (even those that are considered ‘sustainable’) when many studies reveal that shark meat and fins contain toxins like mercury and BMAA? Even the Florida guide to eating seafood recommends “Do not eat sharks over 42 inches” because of the toxins, yet our fishery drives us to target the larger more toxic shark. Is the health of humans of concern to anyone? Although our conservation efforts in the state are better than most of the planet, we must relies that it has failed miserably despite this. For example, if you were to have given me 100% of you money 50 years ago to manage and today I had less than 10% would you think I was successfully managing your money, even if the rest of the managers in the world lost closer to 100%. Why should I think differently with regard to shark management? In my opinion, we now need to move towards shark ‘preservation’ as the new priority, for our attempts at conservation have failed. Based on a lifetime of experience in shark conservation I know that I, along with many of my colleagues in shark eco-tourism, fully support well-planned and appropriate shark fin trade bans everywhere on the planet with the hopes that we can save the future health of our oceans that rely on sharks to keep it in balance. It behooves me to even try to figure out why any scientist would not be in favor of a complete ban for all of these reasons. The only reason I can think of is that if you had your way, continuing to try to manage the shark fishery, this management would require you scientist to get more research and funding in order to sustain it. Is your job more important that the future health of our oceans for generations to come? Unfortunately, because I live at sea without internet doing shark expeditions I came into this late and I leave for sea again now, returning in two weeks roughly. Please Save what few sharks we still have! Hi, Jim, and thanks for commenting. Don’t worry about joining the discussion late, it’s an ongoing discussion and we’re glad that you’re participating. You’ve raised a lot of interesting points and I’ll try to address them all. If I omit one, or if anything needs to be clarified, please let me know. The data I’ve seen supports what you’re saying for sand tigers and scalloped hammerheads (particularly hammerheads). Both species have suffered severe population declines in recent decades, and thus both species would qualify for the special species-specific protections I’ve advocated for in this post and others. A comprehensive fisheries management plan includes special species-specific protections for particularly threatened species and science-based quotas are for species whose populations can sustain fishing. The data doesn’t support that claim. Since 1994, when the U.S. implemented the Atlantic fisheries management plan, many species’ populations have shown signs of a strong recovery. Quotas are constantly updated, and if they are too high we need to lower them, but that doesn’t mean that a quota is not an appropriate way to manage a fishery. The mess largely came about before comprehensive fisheries management was in place (pre-1994), and continues largely in areas without comprehensive fisheries management. Health concerns associated with eating shark are perfectly valid, but are a separate issue. People eat things that aren’t great for them all the time. I fully support education efforts to reduce consumption based on both health concerns and sustainability concerns. While the fin trade is likely the single largest driver of shark fishing, it is far from the only driver. Making it illegal to buy, sell, or possess fins in a state doesn’t mean that no sharks can be killed in that state. Enjoy your trip, I can’t wait to see more amazing pictures! Thanks for commenting. I don’t fully agree with your definition of shark finning. As I’ve noted before in the comments of your previous post on shark finning, I’ve seen sharks landed soley because the fins were sought. Although the carcasses made it to market, the fishermen only did so in order to legally retain the fins. Personally, since the shark was killed primarily for fins, and secondarily for the carcass (to follow regulations in the presence of an observer), I see this as an example of shark finning. One that can be addressed with bans on shark fin trade. I disagree again. If a shark isn’t valuable enough to bring to market without the value of it’s fins, it should stay swimming. Many shark fisheries are under-regulated and quotas are often based on poor and patchy data. The goal shouldn’t be to catch every single fish up to the quota when market forces aren’t even driving the effort (when fins are excluded). Shark harvesting will continue to happen and is fine as long as it is well regulated. But to say the take of sharks for fins doesn’t occur just as long as the carcasses are also retained is incorrect. I’d say “finning” occurs whenever a shark is harvested for its fins. It isn’t my definition of finning. It’s a standard legal technical definition of a specific fishing practice that’s used by fisheries managers, scientists, and conservationists around the world. Sorry to be blunt, but it doesn’t really matter if you personally like the definition. It’s a definition used in treaties, laws, agency rules and management plans worldwide. It has a specific meaning and we can’t change that meaning because you don’t like it. I didn’t say that the take for fins doesn’t occur. I said “finning” doesn’t occur. Yes, and underregulated fisheries are a problem, but I specifically referenced a science-based quota in the point that you’re addressing. In other words, I said that well-regulated fisheries are ok, and you’re response was that not all fisheries are well regulated. I agree, and I don’t support those fisheries. If you consider cases like the one I mentioned, fin bans do impact the numbers of sharks harvested for fins in cases where technical “finning” hasn’t occured- and this is precisely what many activists are concerned with which is why I brought up a broader definition of finning. Why do you think a fin ban won’t impact finning at all, including the illegal finning that occurs in even well regulated fleets? From what I’ve seen, I can only guess that making the trade of fins illegal and likely more difficult won’t encourage finning, and may make fishermen think twice before taking the time to land non-target shark species that are not only dangerous, but cost valuable time. Without 100% observer coverage, what else can you do in a fishery to help prevent illegal finning? ‘Science based’ is not necessarily synonymous with well-regulated so I don’t agree with your restatement. I said “quotas are often based on poor and patchy data”. Keep in mind that is not mutually exclusive of science-based, either- scientists do their best with patchy data all the time, and data poor fisheries still get managed. I am curious, as for not well regulated fisheries, what do you mean by “I don’t support those fisheries.”, and can you give me an example? Sure, heaps of countries banned “finning” but often it is a law on paper, while in reality nothing changes due to loopholes and illegal finning. Moreover, the law is in my view mostly adopted for the inhumane aspect of the practice, but in reality the only difference for the sharks is that they just might die just a little quicker because they don’t return to the water. Just look at “Sharks in deep trouble” by Lesley Rochat. These sharks weren’t “finned” as the bodies were taken to port, but is that any less inhumane? The method used to obtain the fins is still exactly the same: they cut the shark in the neck so the fishermen won’t get hurt and then they slice the fins of the mostly LIVE sharks. So in my view, the term was really ill chosen. “finned” or not tossed, for the sharks themselves nothing much changes, they suffer just as much! So ok, with a little luck, the EU will remove the loopholes and adopt the fins attached, no exceptions policy. At least it will reduce the number of shark(fin)s that fit on the boat. Will that make the EU’s shark fishery sustainable? (The EU still is the largest supplier of shark fins for the Kong market) I can’t imagine anyone would really believe that. There are simply way too many large factory ships out there and the sharks reproduce way, way too slow…. So protect the species in peril! Excellent idea, for example the enforced protection for porbeagles in the EU. Too bad only that Iceland and Norway fishermen constantly keep hauling up “already dead” porbeagles as ”bycath” which they then sell to restaurants all over Europe! Just pointing out that often in order to effectively protect one species, you need a whole bunch of laws and regulations in a bunch of countries and then they all need to be strongly enforced. But it’s all about the fins, right? I guess we all (except Choo Hoo..) agree on that. Many tens of millions of sharks get targeted each year just for their fins. Nobody in the rich commercial fishing industry is really interested in the bodies as there is the ureum which contaminates other catch when stored together, the meat of these for fins targeted species have barely a market value and all it is cheaply sold for (except for the odd yummy mercury mako steak) dog and catfood and fertilizer, next to the cartilage to make false hope pills for desperate cancer patients and dog chew bones… (haven’t ever seen anyone use shark skin as sandpaper around here). In the developing countries it is another matter altogether. The shark meat is next to fish their primary source of proteins. But because of the shark fin trade they now don’t fish a shark and eat it, they now fish out 20 sharks, eat one and let the other bodies rot while they sell the valuable fins. For a while the village prospers, until they are out of sharks, and then a few years later they are out of fish as their reefs died and the fish fled. The traders… well they left a long time ago with the last fins… So how come anyone is actually listening to that nutcase Choo Hoo, (no I don’t think he’s mad, just extremely devious and evil) who claims we can’t devoid anyone for that matter, of the profit made by selling fins? Considering all this, it seems to me at least, quite a pretty good idea to reduce the market (number of buyers) for fins. The less the fins get sold, the less they become valuable and the less valuable they are, the less fishermen who will try to target sharks, no? Therefore I wonder why on earth anyone could oppose a more pragmatic approach, by banning the possession and trade of fins in as many places (with trade of fins) as possible? Just saying, all the higher up mentioned measures have not been able to stabilize the grand scale slaughter of sharks, not even combined with the establishment of marine sanctuaries and the intensive efforts to raise awareness and educate the public, how then can anyone look down on a conservation tool that immediately results in less fins being eaten and a reduction of the sales? Eating shark fin has never been a tradition of the common Chinese, only emperors and noblesse were supposed to eat it! So in my view, seen the current situation, ALL possible efforts to reduce shark mortality should be used and welcomed (definitely shark fin bans! And of course I think also even the small grassroots initiatives matter). You can go on endlessly over the “right” way to save sharks, while you are busy planning and discussing strategies, they are going extinct. Hi, Katrien, and thanks for commenting. I’ll address some of your points here (many have indeed been addressed earlier in the comment thread). Your English is fine. Agreed- very few countries have a “National Plan of Action for Sharks”, and that’s a big problem. This doesn’t mean that fisheries management plans don’t work, it means many countries aren’t using them. Countries that are using them, like the U.S., have relatively good shark fisheries management. They work, we just need more countries to implement them. The issue with shark finning isn’t just that it is inhumane. The issue is that it is wasteful (most of the weight of the shark isn’t used when the body is thrown overboard) and hard to manage (managers can’t tell what species is being fished when they see a pile of detached fins). Cutting the fins off at sea is still allowed in countries whose fisheries are managed by a “fin ratio”, as described above, but I advocate for “fins naturally attached”, which means that entire shark is landed. Indonesia is the largest shark fishing nation in the world, not the EU, and Indonesia still allows finning. Fins naturally attached is not the only policy I advocate, and therefore no, adopting a fins naturally attached policy will not automatically make the EU fisheries sustainable. I never claimed otherwise. Much work still needs to be done to make the fishery well managed. Fins naturally attached is a major improvement over fin ratios, though. Bluefin tuna are a great example of how to NOT manage a fishery according to science-based quotas. As you correctly pointed out, a science-based quota is recommended, and then managers ignore it and fishermen ignore it further. This is obviously not the system I’m advocating for. I’m advocating for a system where the science-based quota is followed and enforced, which successfully happens in many fisheries around the world. The fact that a policy has loopholes that are exploited by fishermen means that the policy needs to be altered, not that policies in general don’t or can’t work. Absolutely, and I support culturally-sensitive education efforts to reduce consumption. But unless a fin ban is passed in China, the market isn’t really reduced very much. The U.S. consumes much less shark fin than China. Even if we pass a fin ban in every state (or a national-level ban), which isn’t likely to happen, it won’t have a major impact on the demand. I specifically mentioned bycatch reduction policies in my brief explanation of what a well-managed shark fishery should look like. Fin bans do absolutely nothing to reduce bycatch. Most of the above mentioned measures I advocate for have yet to be adopted on a large scale. Where they have been adopted (i.e. the U.S.), they work pretty well at stabilizing shark populations and allowing a fishery. There are still issues that need to be addressed, but the system allows for intermittent improvement and modification as new data comes in. Fin bans don’t reduce consumption very much because the places they are implemented aren’t places where there is a lot of consumption to begin with. Additionally, the conservation movement appears to be overwhelmingly focused on fin bans, when the passion of so many concerned citizens could really make a difference in getting improved management. I said it was my impression that many governments accept/pass a “finning ban” easily just because they don’t want residents to think they allow the inhumane practice of slicing fins of live sharks. They don’t pass the law because of the waist as there is no profit to be made from bodies and not because they want to identify the species as the fins are simply sold by weight/dimensions. But the people are cheated as the sharks’ fins are still sliced off while the shark is alive as long as removal of the fins at sea is allowed. I wish you would have mentioned that in your explanation of “finning” as the technical term is misleading. Which is why the EC proposal is called “fins naturally attached – no exceptions”. If I can try to summarize a very long discussion, you’re saying that management is a good goal, but there are lots of specific cases where loopholes are exploited or people ignore the rules. Is that a fair summary? Obviously loopholes and lack of enforcement are major concerns, but fisheries with loopholes and lack of enforcement aren’t what I’m calling for. Summary would be that, seen the current situation, ALL available tools for reduction of shark mortality should be welcomed and encouraged (and not downplayed) as time has proven that the few governments which make an effort to implement a sustainable shark fishery are exceptions, the vast majority does not, tries to stall as long as possible or includes loopholes. While one fin trade ban may not influence shark mortality very much, nor does a single local shark fisheries law and while you need only one law passed to ban the entire shark trade from one area, you need MANY laws passed to create a sustainable fishery (fins attached, endangered species, quota, …) and all these need to be enforced instead of one. The most destructive aspect of this blog is in my opinion that you discourage the momentum. Not even you can predict where the trade bans will lead us and what their final impact will be. Correction: in the tuna paragraph I ment to say tunas are an irreplacable resourse, both as food and for its role in the ecosystem as predator. And in my haste (and due to disgressing, my apologies for that…) I forgot to mention the other reason I think fin bans are certainly valuable: Many laws concerning fishing are extremely hard to enforce because its impossible to control all the fishing vessels at sea. By the time the catch is unloaded, it is (without DNA testing) often impossible to track where the catch comes from. The complicated task to control from where and from which species the fins originate is unnecessary/bypassed in a place with a shark fin ban as no fins are (legally) sold and I believe that a black market on land is easier to fight then IUU fishing at sea is. If fins became more expensive on the black market because of shark fin bans, it would in my opinion dramatically decrease, not increase the market/incentive to harvest fins illegally as the fins would become too expensive and hard to come by (as the fins could only be purchased/sold illegally)for all the general common and middleclass residents. This is really an extremely interesting debate and kudos to David for having initiated it. I’m frankly on the fence here. Yes intellectually, David’s good management etc are clearly the best way forward – but on a global scale, they have failed miserably and we really don’t have any more time to wait that things improve but need to act now. I think that conservation strategies need to be locally different depending on the concrete situation on the ground and that right now, sanctuaries and blanket bans are necessary – but those US fin bans do irritate me never the less! And, we need a radical change of paradigms and reverse the burden of proof! Much too long for a comment in this thread – but I’ve tried to formulate my standpoint here. They haven’t failed because they haven’t been tried. Relatively few countries have a fisheries management plan for sharks at all, and many that do don’t have one as thorough as what I’m calling for. With respect to your paradigm shift where those who use natural resources should have to demonstrate that they WON’T harm the environment instead of the other way around… hell yeah, sign me up! Unfortunately I don’t expect that to happen any time soon. Hi, Andrew, and thanks for bringing your comment from the Support Our Sharks page to the discussion here. Banning the sale of fins isn’t happening in many countries. It’s largely happening in some U.S. states and some cities in Canada. These aren’t major consumers of fin. I will happily concede that banning the sale of fins in China would make a major difference in the conservation of sharks. However, that isn’t going to happen, and banning the sales of fins in Oregon is NOT going to make a major difference in the conservation of sharks. The government there is not going to ban fin sales, so I suggest that we do everything we can to improve the sustainability of the supply by implementing what I (and many other scientists and managers) are calling for- well managed shark fisheries. Readers may be interested in moving the discussion over to this post: Check out Episode 1 of Blue Pints: shark fishing, shark finning, and finding common ground in shark conservation – where we continue discussing the issue via a google+ interview. I will continue to address new points raised in this thread, but at this point people are starting to repeat comments (which often happens in a 50+ comment thread). As the Southern Fried Scientist suggests, I suggest we move this discussion to the Blue Pints post. So consider yourself officially signed up – meaning that henceforth, I’m fully expecting you to advocate invoking the precautionary principle & turning around the burden of proof! I know it’s not gonna be easy – but we got to at least start talking about it, right? And since we’re at it, can we agree on the following? And if so, would that not be the typical situation where the precautionary principle ought to be invoked? – I totally agree with you that in an ideal world, perfectly managed Shark fisheries are the way to go. But of course, the world is far from being ideal and whilst we’re investing time and energy trying to formulate perfect management plans, those Sharks continue to be killed. – Blanket bans are stop gap measures that have immediate effect and where enforcement etc is relatively easy and cheap. As time is of the essence, I consider them the best practical solution in places where there are no good management plans. Once we have those bans in place, we then have the time to let depleted stocks recover and to formulate & implement proper management plans – after which the blanket bans can be modified via exemptions, or abolished altogether, but ideally only once the other side has convinced us to do so. What I’m trying to say here is that maybe, the different standpoints in this thread are not necessarily as mutually exclusive as they may appear at first glance? ” can we agree on the following? I largely agree with that, though I wasn’t aware of any upcoming papers about the shark fin trade, and I’d clarify that areas where well-regulated shark fisheries are in place, shark populations are starting to rebound. All of this is evidence that we need to step up pressure for fisheries management. Any place that has been resisting adequate fisheries management sure isn’t going to pass a blanket ban. If your goal is to have a stopgap measure with immediate effect, what you want is a fishing ban, not a possession of fins ban. Fin bans do not directly impact fishing, and they certainly don’t stop all fishing for sharks as many supporters claim. But again, the problem is largely in areas that have no management or inadequate management, and those places aren’t going to pass a ban. With sufficient pressure, a fisheries management plan could be put into place. My “peacemaker ways” are usually more of the Colt peacemaker kind so consider yerself fortunate! Yes from what I hear there are currently two papers being reviewed: one is re-visiting Clarke’s paper that focuses on the Asian trade data; the other one looks at the issue from the other side and analyzes the catch data. Concerning the strategies, here are two examples. So far, there is not any national PoAS, zero, to the point that Fiji has been singled out for not even bothering to report any shark fishing data at all, this because they simply haven’t got the resources to collate them. At the same time, Fiji is a major fin hub exporting them at the tune of approx 140 mt/year. As you know, Pew & CORAL are currently assisting fisheries in trying to establish a shark sanctuary. That includes a blanket shark fishing ban, trade ban & fin possession ban, etc. The rationale is that this is way more effective & efficient, and way faster to implement than trying to establish a well managed shark fishery starting from zero and above all, way cheaper and easier to enforce. And there are also other important considerations like wanting to preserve a pristine marine ecosystem, culture & tourism driving the process. In places like, say, HK & Singapore local shark fishing is, if at all, negligible but those are of course major trading hubs and also major consumers. There, shark fin bans do make a lot of sense. If you have followed the debate, the fin industry is countering that sharks are not endangered and that fin bans are inappropriate, so having researchers (meaning you) state that they are against fin bans is worrisome as it may lead credibility to their claims. I know what you meant and do concur in principle – but you can see why some people have gotten angry. Anyway, all I’m saying is that globally, different places require different approaches and that fin bans may be a useful component of some local strategies. Ultimately, the moral/ethical question that arises is this : Should we eat shark’s fin soup at all? My answer is that we should not if sharks are an endangered species, just like we do not eat whales, dolphins, tigers, elephants. bears, white sturgeons, snow leopard or panda bears etc but as anyone who is not blind or ha a mind that is not closed can see from the ‘Facts on Sharks’ below, that sharks are not an endangered species. 1 The Convention on International Trade in Endangered Species of Wild Fauna and Flora (Cites), the UN watchdog on endangered species (not the IUCN) has not listed any sharks as an endangered species. Only 3 out of about 400 species are on the watch-list for trade purposes ( Whale shark, Basking shark and Great white), though they are not necessarily classified as endangered. Cites represents 175 Governments and IUCN is an NGO. 3 The biggest killers of sharks are the industrial-scale longline fisheries in the developed nations like the US, UK, France, Spain, Italy, Portugal using up to 140km of longlines with 10,000 hooks and purse seine nets to target the more valuable bluefin tuna and swordfish but millions of share are caught unintentionally as a bycatch. 4 Even if all the world stop eating sharks fin, millions of sharks will continue to be killed as a bycatch unless legislation or regulations are in hand to stop these wanton killings in the West. 5 Asians are not the only consumers of sharks, The US consumes over 20 million lbs of just one species of the sharks in 2011, the spiny dogfish deceptly sold as graysteak or fishsteak and 44 million lbs of the same species are eaten in the EU as Fish & Chips, falsely labelled as Rock Salmon in the UK; in France as saumonette, in Germany as Seaal and Schillenlocken, in Italy as spinaroli. In Australia and New Zealand and Oceania millions of lb of shark meat, called flakes, are eaten in fish & chips dishes. If Western consumers can feast on 95 % of the shark (the meat) why are they going ballistics when Asians feast on the other 5% of the shark (the fins) which are unappreciated and discarded anyway, especially when almost of the Governments have not listed sharks as an endangered species? Why the double standard? 6 Those who claim that over 73 to 100 million sharks are killed each for their fins are not telling the truth as these figures contradicts FAO catch statistics. This was exposed by Dr Shelley Clark, whose doctorate is on this topic. In the year 2000 she came out with an estimate of a minimum of 26 million killed to a maximum of 73 million but she warned that most wildlife activists misreported her estimates and only use the maximum of 73 million or worst 100 million, which she says has no scientific basis. This slanted use of data marginalizes and devalues the researchers who are working hard to come up with an impartial data she cautioned. The truth is that no one knows how many sharks are killed for their fins. She cautioned that ‘exaggeration and hyperbole run the risk of undermining conservation campaigns’ and ‘selective and slanted use of information devalues and marginalizes researchers, who are working hard to impartially present the data’. 7 There are about 400 species of sharks ranging in size from 8 inches to more that 50 ft like the killer whales. To claim that eating sharks fins soup will somehow cause the 400 species to be come extinct has no merit because not all sharks are used in this cuisine. Also not all sharks are apex predators. For anyone to claim that 126 species of sharks are endangered without proof that claim is is based on bad science and egregious agenda. 8 Western wildlife activists have been trying to stop this traditional Asian cuisine for the last 10 years or more while their longline fisheries are the ones killing sharks on an industrial-scale and while their consumers are busily eating fish & chips made from shark meat and while they deplete the world’s oceans of giant bluefin tuna, swordfish, cod, sailfish, halibut & Haddock (both near extinction) and giant Alaskan crabs. If that is not hypocrisy then what is? If that is not cultural imperialism then what is? ‎9 The video showing a shark being finned and thrown overboard was in my opinion, a fake as the shark was thrown overboard with its tail fin intact. That was the most prized of all the fins. It was like throwing out the banana and keeping the skins. That mistake gave the game away. 10 Poor fishermen in the Third World would never throw away food when it can be used to feed the whole community. It is only the rich fisheries that would do that to make freezer room for the more expensive targets : swordfish and giant bluefin tuna, the latter of which can fetch over US$50,000 each at the Tsukiji wholesale fish market in Tokyo. The record paid was Us$400,000 one giant bluefin. An industrial-scale fishery setting out to target low-value sharks has obviously the wrong business-model and it will go bankrupt. But if the world chokes off the supply of shark’s fin its price will soar and sharks will suffer as they will become targets. 11 Shark’s fin soup is served mostly at wedding banquets but copious amounts of fish and chips made from shark meat are eaten EVERY day in the UK, EU, US, Australia and NZ. Is that sustainable? Obviously not and yet the anti-fin lobby has turned a blind eye and fixated their campaigns on banning shark’s fin soup. 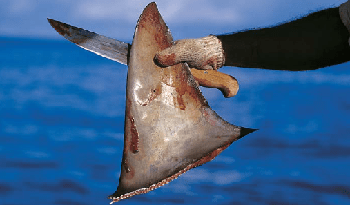 12 Those who claim that shark fins contain mercury is telling a lie. According to the tests in Singapore mercury is found in the shark muscle but Shark’s fin has only very little muscle. The FDA in the United States confirmed that mercury was found in shark meat. Since the US, UK, EU, Australia and New Zealand are major consumer of shark meat why are the wildlife activists not warning US children and pregnant women to stop eating shark meat, instead of dwelling on polemics on a traditional Asian cuisine? Is that a case of selective amnesia or a breach of their duty of care? 13 If wildlife activists genuinely wish to save millions of sharks it is obvious that they should campaign for legislation to ensure that longlines (some as long as 140 km in length) to be regulated all over the world as this will reduce the bycatch exponentially. Excoriating shark’s fin soup will not help their cause. If the West is concerned about the extinction of a marine species, paradoxically it is the tuna that you should focus your undivided attention on (since the ICCAT won’t) as the FAO 2008 tuna catch data showed that it exceeded that of sharks by at least 800% and there are only about 40 plus tuna species versus over 400 shark species. They should also campaign for fish and chips made from shark meat to be banned in Australia, New Zealand, UK, USA and the EU if they seek the ban on shark’s fin soup here, otherwise critics will say this is just a case of selective amnesia and a form of Cultural Imperialism. I have no commercial interests in the shark’s fin trade and I lobby for no one. Currently, shark fisheries in much of the world are unregulated and unsustainable. In other areas, they are better regulated and more sustainable. Fisheries for shark fin are not the only driver for shark fishing, but they’re one of the biggest. I’m not saying that there aren’t any problems with shark fisheries- quite the opposite, I’m arguing that they need to be strictly regulated because many are currently unsustainable. This includes fisheries associated with fins as well as those for meat. When a giant bluefin tuna can fetch over US$50,000 each at the Tsukiji wholesale fish market in Tokyo, (the record paid was Us$400,000 one giant bluefin), an industrial-scale fishery setting out to target low-value sharks has obviously the wrong business-model and it will go bankrupt. The reality is that million of sharks are bycatch of the pelagic fisheries and that is why legislation must be in place to reduce this bycatch to save millions of sharks. If the world chokes off the supply of shark’s fin its price will soar and sharks will suffer as they will become the next target, next to the giant bluefin and swordfish. Now they are mostly bycatch. As Dr Shelley Clarke says, no one knows how many sharks are killed for their fins. To be sustainable sharks caught for their meat, like the spiny dogfish, needs to be regulated and fish & chips made from shark meat in the UK, US, EU, Australia and NZ need to stop too if the West wants to stop the sale of shark fins. I uderstand the article well, but it makes my blood boil that we are talking about the right and wrong way to collect fins. People who care about the ocean and sharks in particular, should be concentrating their efforts into banning shark fishing full stop, banning the landing of any shark product. Articles to make the general public and governments aware of the damage been done, would be far more useful. The best way to stop any of these practices is to get the worlds major wildlife organisations to push to make it ileagal to use any shark parts, as has been done in africa with rhino horn etc, that stops the resturants in the Philippines, Taiwan and China selling shark fin. THERE IS NO ACCEPTABLE WAY TO TAKE SHARK FINS, FULL STOP. This post is one of over 1,300. We’ve covered many other topics, including the damage cause by overfishing. If you believe that we need to concentrate on banning shark fishing entirely, you should still recognize the importance of correcting misunderstandings of shark fisheries management- many believe that fin bans will result in a “full stop” of shark fishing, but they do not. “many believe that fin bans will result in a “full stop” of shark fishing, but they do not.” Who? Activists on Facebook? Not on single credible, responsible shark conservation organization has every claimed that. In fact, the emphasis is always on the FACT that the demand for shark fin is the primary driver in the depletion of many shark species…see my earlier comments. And again, no credible, responsible shark conservation organization has every claimed or asserted that shark fin bans are the only tool for effective action; only that it is a viable and useful one certainly in combination with increased fisheries regulations (see multiple comments above). 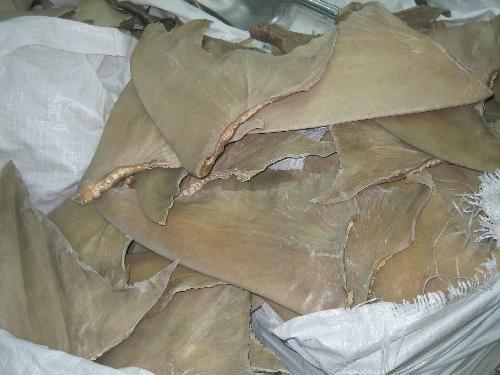 If this blog was meant to address verbose, passionate, on-line activists then it should also have cited the excellent, professional work of advocates working at the heart of the shark fin trade, in Asia. As for Mr. Tan, more detailed rebuttal will follow addressing the mis-information in his comments. We note that these same comments have appeared in the press before. As has already been pointed out, this post is not directed towards responsible credible organizations, but uninformed (though well-intentioned) activists of the kind you describe. There are a lot of these. Sure, but the overwhelming focus of many conservation organizations lately has been fin bans. I get “action alert” e-mails from some organizations that have discussed almost nothing else for several years. And while some conservation organizations occasionally focus on high-profile issues other than fin bans (CITES, ICCAT, etc), I have yet to see a single action alert calling on an organization’s members to support a proposals that would lead to 10% quota reduction based on new population data, a proposal to require gear modifications to reduce bycatch (different leaders, different hooks, etc), or proposals to temporarily ban shark fishing during certain times of the year at certain key migration or mating aggregation locations. These types of proposals happen all the time at regional fisheries management organization meetings, and often fail due to lack of support. If the passion and organization of the shark conservation movement put as much effort into helping sharks through fisheries management meetings as they put towards fin bans, it could do a lot of good. I think basing your understanding of the intricacies of global trade policy and the vast and varied work of reputable shark conservation groups on ‘action alerts’ is a mistake. If you have an OPINION about the value/strategy/application of such bans, talking to people who have been working on them and learning more about them is likely a better approach. You seem to have a very clear understanding of the need for public support of specific initiatives at these fisheries management organization meetings…so, WHY are they failing at reaching the public on their need for support? Perhaps they and you could reach out to organizations that specialize in campaigning and working with the community — advocacy doesn’t just happen; it takes cooperation and planning. That might be a positive step in the right direction. Additionally, much of the work towards CITES listing and regarding fisheries policies happens ‘behind the scenes’ at most organizations — these are not generally ‘public’ campaigns; but that and “many, many” other initiatives are in the works, always. Information about ‘bans’ goes out to the public more, because it is a public issue. As a member of the general public, you won’t get ‘ACTION ALERTS’ asking for your support of a CITES listing or a delicate negotiations with local fishermen to create sanctuaries. While I cringe at the pseudo-science that gets thrown around, unfortunately there aren’t many good examples of sustainable shark fisheries either. My personal take on it is that the campaigning that leads to finning bans and the like can also help create the political environment necessary for the implementation of credible management. It seems like, all too often, science-based limits are just a starting position for negotiations. What I’d really like to see now is an increased effort to engage with Chinese consumers, in a culturally appropriate way, to introduce both the scientific rationale and the more evocative reasons for conserving sharks. I’ve done several interviews this year with Chinese journalists who find sharks absolutely fascinating. It’d be great to get funding for a Chinese media trip to swim with whale sharks or similar – I’m sure at least some of them would become instant shark advocates! I wouldn’t characterize this as “conservation vs. management”, though. It’s more a discussion of which tools are most appropriate for conservation and management. There are some, and they are in areas (like the United States) where many of the policies I’ve been advocating for in this discussion have long been implemented. Areas which overfish are areas which don’t implement these policies. In other words, these policies work when they’re used properly. That’d be great. Campaigning for credible, comprehensive management at the same level of intensity of what’s been going on for fin bans would be better. Many NGOs, including Samantha’s, are doing a very good job with efforts like this, and it has resulted in major hotels and restaurants taking shark fin soup off the menu. WildAid also stands out in this arena with their recent Yao Ming PSA. I expect that any journalist or policymaker from China or other major shark consuming nations would be welcome to join us on our shark research vessel and learn about the issues. I’m just a graduate student and can’t say that for sure, but I expect it would be the case. What Simon said. And that is a great idea about the Chinese media! very crafty indeed – but as we all know, it’s ultimately nothing more than a clever distortion of the facts. Long story short: if the Shark fin trade wants to survive, it has to reform. There’s nothing wrong with eating the fins – provided that they are sourced legally and ethically, and come from well managed and sustainable fisheries. The current state of global shark fisheries management isn’t very good, as those numbers and many others show. However, it isn’t quite as scary as that figure would cause us to believe. While there are 211 “shark fishing nations”, 20 of them account for more than 80% of the total global catch. Most of those do ban finning, and several (EU nations) are on the path to adopting a “fins attached” policy in the next year or so, and 13 have a “national plan of action for sharks” (a relatively comprehensive fisheries management plan that includes catch limits and policies for threatened and endangered species). I’d like to point out (and correct me if I am wrong) but as of 2011 some of the 13 NPOA countries weren’t available for analysis, so we don’t know if they are comprehensive. In others it is unclear how well implemented the plans are or if they are being reviewed/revised. I have listed 14 facts and if you can, please show me where “it’s ultimately nothing more than a clever distortion of the facts.” Talk is cheap. If Cities is allegedly not doing its job to protect sharks since no shark species is listed as endangered, then why is that under the laws of the USA, UK, France, Spain, Portugal, Germany, China, Russia, Japan etc, no shark is also listed as endangered? Is there something wrong with the major govts in the world or is it because the anti-fin lobby is distorting facts, to wit : over 73 to 100 millions sharks are killed for their fins and two thirds of all shark species are endangered and there is methyl mercury in shark fins? The EU is the biggest supplier of shark fins in the world. Are you accusing them of ‘cutting of the fins and throwing away the sharks’? If so then where do they get the millions of lbs of shark meat to eat in the US, UK, EU, Australia and NZ in fish & chips deceptively labelled as rock salmon in the UK, as saumonette in France, as Schillerlocken in German and as flakes in Australia and NZ? Not gonna take the bait, sorry. Read my post, linked above, and comment there. I am not surprised that when asked to put your money where your mouth is you are lost for words. This is because you are unable to state which of the 14 facts list are “ultimately nothing more than a clever distortion of the facts.” Talk is cheap. Think about this : if Western consumers can eat tens of million of lbs of 95% of the shark (its meat),deceptively sold as flakes, rock salmons, huss, schillerlocken, saumonette or palombo and spinaroli, without guilt, why are you all going ballistics when Asians prefer to eat the remaining 5% (its fins) at wedding banquets? If finning is barbaric, which it is, then make it a federal felony, why ban an Asian traditional cuisine. If the farmers treat chickens and cattle in a barbaric fashion and it has happened, why not ban KFC and the Big Mac? If the West wants to stop the Chinese from serving shark fin soup at wedding banquets, then would it be more sanguine if shark meat fish & chips and schillerlockens are served instead? Go figure ! I am ‘occupying’ Dashark’s moribund blog ONLY because you are unable to tell me which of my 14 Facts listed is “ultimately nothing more than a clever distortion of the facts.” Talk is cheap. You also accused me of being a troll. I am tempted to return your compliment in kind and call you a bozo but I shall not descend to your childish level, because when a person attacks the man and not his post, then in the silent rule of debate, he is a loser. You, pal, are a loser. So when are you going to get off your backside to campaign for legislation? If the “fin trade is completely non transparent” so is the shark meat trade in the US, UK, EU, Australia and NZ. But the nuance that has escaped you is that the EU is by far the largest supplier of shark fins in the world. If you want reforms then surely it ought to start from the supply end of the equation (the ‘traffickers’). For your info, the top shark fishing nations in the EU are Spain, Portugal, France, Italy and your own country, UK. I have nothing against fish & chips made from flakes, rock salmon or huss or dishes like saumonette, schillerlocken or spinaroli so long as the shark meat comes from a certified source. But how can you be sure that they do? As for Cites, which is a United Nation body, with 175 govt members, you can vilify it till the cows come home for all I care.